I'm super pumped about how training went last week! No, I didn't hit a new weekly high mileage but I did get in what I feel like were some quality miles including "longish" back-to-back runs on Saturday and Sunday. We changed the Ultra VT group run from Wednesday evening to Monday evening and consequently my weeks have become much longer as far as consecutive days running. I've switched up my schedule to include six days on and one day off using Tuesday as my rest day. Despite the longer weeks I felt really strong on my run Sunday after a hard effort Saturday. A good sign for Holiday Lake this weekend! Monday evening, we had our first Monday evening Ultra VT group run and witnessed Mr. Mike Jones pull off a barrel roll during the run and continue running as if nothing had happened. We were joking about parkour at the time, which made the spectacle that much funnier! 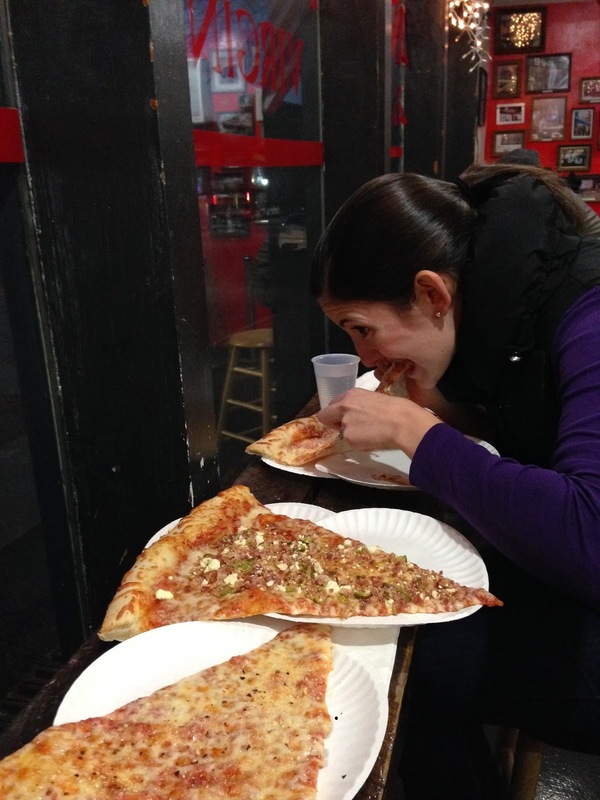 Around mid-week, I received the awesome news that Michelle had won a free entry into the Baltimore Running Festival! We had entered a contest on Facebook where 100 squares were assigned to the score of the Superbowl and it just so happens that Michelle's name was in the square for the final score (kind of). While the first, second, and third quarter winners received free T-shirts, the grand prize winner (Michelle) won an entry into the Baltimore Running Festival and she was kind enough to let me register for the Baltimore Marathon with her free entry. SWEET! On a different note, there has been a resistance to the Monday evening group runs from the folks who can't make the new scheduled time, which is kind of awesome because it means there are two group runs during the week. As I've mentioned before, it's awesome to get out with a group and it gives me incentive to get out the door even when I'm struggling for motivation. We had a pretty solid group Wednesday evening and went out for a little over an hour. We found some super steep roads in Blacksburg and explored some roads I had never been on before! On Thursday, I saw an ad on Facebook for a free audio book via Audible, Amazon's audiobook company. If you agree to sign up for their monthly service (which I intend to cancel prior to the subscription beginning) you receive a credit to download a book. I decided to download Into Thin Air by Jon Krakauer to listen to on long runs. I remember reading about a few cyclists that listen to audio books while riding and figured I'd give it a try while running. It really made the time go quickly and I enjoyed the book a lot! So much so that I listened to another four hours on Saturdays long run. I didn't intend for Friday to be a rest day but when I got home and sat down, I dozed off on the couch and awoke when Michelle got home. I guess I needed the rest. I woke up early Saturday morning and headed north to Roanoke to scout the Blue Ridge Marathon course, which I'm a blogger for and announced in a post back in August. I intend to do a separate post about previewing the course but I'll leave you with this picture: Mile 7.3 where some sections of the road are up to 15%! Saturday evening, we enjoyed an awesome dinner at The Cellar with Michelle's parents and our friends Bob and Cheryl who live in Salem. It was an excellent way to recover after a long run and hard effort for the day. After last Sunday's debacle on my long run, I was determined to get in a decent run on Sunday and headed down I-81 to Pulaski to to get in an easy 12 on the New River Trail. I decided to park in Pulaski and see a different part of the trail rather than the same old section of trail I run from Draper. I had just turned onto the New River Trail from a connector trail that runs into Pulaski, about six miles into my run, when I ran into Pawel another runner here in Blacksburg and his training partner Geoff. Pawel asked me how far I was running and invited me to join them. I had been listening to a podcast and had just started another when we met up and I welcomed the change in pace (literally) and the company. We turned out a solid 5 miles together before I turned around to head back toward the car. I managed to get in 15 for the day, 14 and a mile cool down with the first 6 of the 14 being more relaxed with the remaining eight getting progressively faster followed by a mile "easy" cool down. I was super pleased to get in 63 miles this week and felt strong for most of the miles. 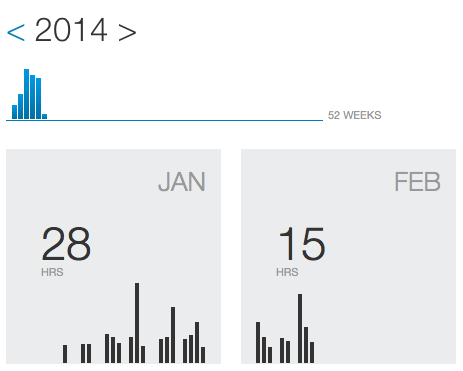 Additionally, I managed to log those 63 miles over 5 runs compared to the previous week when I did 61 miles in 6 runs. Looking forward, Holiday Lake 50k is this coming Saturday and it's currently dumping snow outside. We're expecting ~12-14" and Appomattox, where Holiday Lake race is held, is expecting a foot, which could make for a very interesting 50k and long day Saturday. I was feeling confident about my ability to put in a solid run but with the weather I think I have to adjust my expectations and simply set out for a fun day on the trails! As I look at my training this year, it's interesting to see the difference in volume of January and February between this year and last year. Last year, I managed 25 hours between the two months. 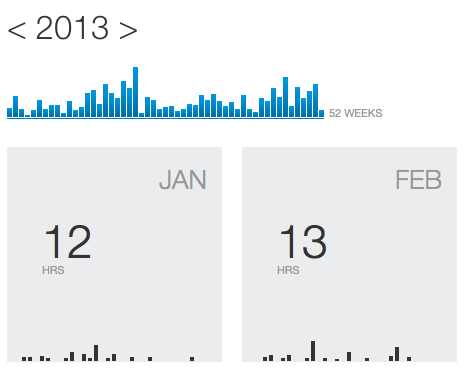 This year, despite taking the eight days of January off, I bettered the first two months combined in January alone! Posted by Unknown at 1:57 PM I'm reading from MyDailyGround: Training Week 2/3/2014-2/9/2014 Tweet this!